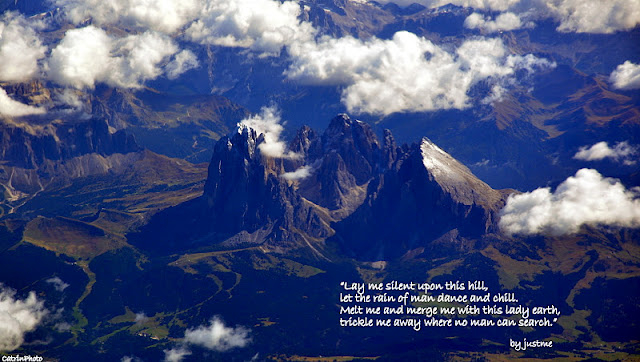 Catrin took this picture flying across the Dolomites in September 2010. Justme wrote his poem in Ireland, July 2011. All images and poems have a story attached to them. The exciting part is the merging of two moments into one – or have they ever been apart ? When you could cry for me? From twangs of sad and pulls of cold. Let the rain of man dance and chill. Then slice open the earth . Let me fly back home. This entry was posted in Death, Longing and tagged Homecoming, Oneness by Michaela. Bookmark the permalink.